Important - This is for Wheaten owners anywhere in the World! The Wheaten Health Survey is now online! 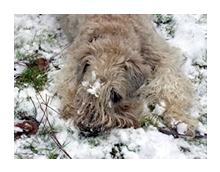 Please take this survey for any Wheaten you own or have owned since 2000.
from: The Soft Coated Wheaten Terrier Club of America, Inc.
in an overall Health Survey specifically designed to identify any significant health or temperament concerns in the breed. With your assistance, we will determine the overall health of the breed and prioritise future research. We hope that you will partner with us in this exciting endeavour. We know you will agree that the Soft Coated Wheaten Terrier is a very special dog and together we will do all in our power to protect and advance the interests of our beloved breed. This is an anonymous and confidential survey which is available on Orthopedic Foundation for Animals website. "OFA offers breed surveys for a number of breed parent clubs. These surveys are offered free of charge. All data is used only in aggregate and is kept confidential. No survey results will be traceable to any individual dog. It is hoped that this information will be valuable to breed clubs as they assess the health issues of their breed." Please complete the survey once for each Wheaten (purebred, no mixes) that you have owned between 2000 to the present, living or dead, healthy or with health issues. The survey should take about ten miinutes but be sure you have the dog’s health records at hand when you begin. Overall results are compiled by OFA and are available on the Survey page. This link will take you to the Health Survey page on the OFA website, select 'Soft Coated Wheaten Terrier' from the list. Please pass the word and ask all Wheaten Terrier owners and breeders to complete the survey for their dogs. Your responses provide invaluable information for the overall health and well-being of our breed. Thank you for participating in the Soft Coated Wheaten Terrier of America, Inc. Health Survey.